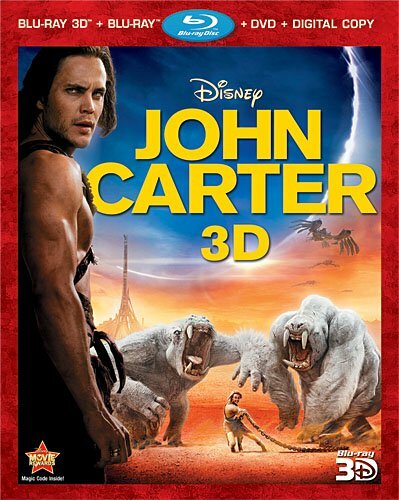 The epic tale of John Carter is a sweeping action-adventure set on the mysterious and exotic planet of Barsoom, which is known to humans as Mars. The movie's lead character, John Carter [played by Taylor Kitsch], is a war-weary, former military captain who's inexplicably transported to Barsoom and reluctantly becomes embroiled in an epic conflict. It's a world on the brink of collapse, and Carter rediscovers his humanity when he realizes the survival of the planet and its people rests in his hands. How did you win the role of Dejah Thoris in John Carter? I had an audition where [John Carter director] Andrew Stanton showed me all of the visuals for the movie. Usually, you walk into an audition room and act for three minutes before leaving - but this was different. I was thinking, 'Why is this man doing this? This isn't a regular audition!' At one point, I actually thought, 'He doesn't know what he's doing here.' And then, as I was leaving, he shook my hand and he said, "Lynn it would be such an honor to work with you." How did the screen test go? There were five girls and five guys testing for the roles of Dejah Thoris and John Carter. I would have to pass the tiara to the next girl, wait, and eventually the tiara would come back to me and I'd be able to do my thing again. I read with every guy and then there was about two weeks of waiting - but I remember exactly where I was when I found out the good news: I was getting a facial. When the facial was finished, I looked down at my phone and it had completely blown up. There were so many missed calls and so many texts - and I knew exactly what it was all about. I freaked out and I called Taylor Kitsch [who plays John Carter] right away because we're good friends. We'd both got these two amazing roles and we were ecstatic. I remember screaming down the phone, "This is a coup! What have we done? This is amazing." We were over the moon. What goes through your mind when you're standing in a room with four other girls auditioning for the same role? It's tough, but the adrenaline takes over. It's bizarre because everybody in the room usually has a similar look to you, so you have to push yourself as far as possible. You have to push your performance and go for it. You have to swim through it, stand tall and stick to your individuality. How do you know Taylor Kitsch? Taylor and I were in a movie called Wolverine together. He also did a movie called The Covenant with my husband, Steven Strait, so we've known each other for about eight years. Taylor is a great guy and an amazing actor. It was a real joy to be able to work with him again on John Carter. I think he brings so much to the role. When did you realize you really wanted to win the role of Dejah Thoris? When I read the script, I was immediately attracted to the project. A character called Matai Shang [played by Mark Strong in the movie] has a monologue that really drew me in. I was so moved by it. And then I read the whole script again and looked at Dejah more closely, and the meaning of the film really got me. What's your favorite costume in John Carter? My favorite outfit is all the armor Dejah wears in the movie. That's how you see her at the beginning and it's the first impression you get of her strength and prowess. To me, that is how she starts - and then you follow her on her arc, which ends with her in a wedding dress with her hair down. The costumes all say something emotional about her journey, but the armor was amazing. Was the extravagant wedding dress comfortable to wear? It wasn't comfortable, but it was very beautiful. To be honest, I was very happy to be wearing it because I thought it looked amazing. I didn't think about it being uncomfortable because I just thought about the scene and what would be going through Dejah's mind. Were you worried about the physical demands of the role when you signed up to appear in the movie? At first, I was pretty nervous about the physical challenges of the role. There were extensive amounts of fighting and wirework. Plus, I had a terrible fear of heights. Taylor's character can jump huge distances and a lot of these jumps involved holding me, so of course I was flung everywhere. It was tough at times, but it was very fun as well. Did you adhere to a special diet to prepare for the role? While I was shooting and while I was training for the role, I had to eat some sort of protein and complex carbohydrate every three hours - and I drank a lot of shakes. However, they were wonderful shakes, so I didn't suffer. They were raw vegan shakes, so my skin was amazing during the film shoot. I also drank a lot of smoothies and watermelon juice because that clears the water out of your system. I'm a big water retainer, so it all really helped. Did you work out every day during the film shoot? I had to work out all the time, which was physically demanding - but it was all worth it. I would box a lot, plus do a ton of weightlifting and running. And, of course, we would have our sword training sessions, which were brutal. Sword fighting is such a workout - and so much fun. Have you kept up the fitness regime since filming finished? I haven't kept up with the fitness regime because all of the films I've done since John Carter are roles involving women who are not meant to be super-buff. They are normal-looking women, so after John Carter, I gained 15lbs for a role. I eat a lot of yogurt because probiotics are super-good for your skin. I'm a skin fanatic, so I also eat a lot of fish and a lot of sushi. In fact, I have to watch it sometimes because I can eat too much. I'm from Texas and my real weakness is beer. I don't drink anymore, though. Instead, I drink non-alcoholic beer. That's my poison now, and I love it. We've got one more question for you, Lynn: John Carter is an interplanetary adventure, but do you believe in life beyond Earth? Right now, I think there's definitive research that indicates there are minute small life forms in the universe. If you're talking about human-like beings, then that jumps at me as more a question of dimensions. Physicists have come up with this idea that we're living in a dimension and there could be many. So is there other life? Well, I think there's other time and other space.